I like high fantasy movies. I don't need a movie to be grounded in reality or have to be embraced by logic in order to work for me. As much as I love a movie that tells me something true, sometimes I want to see something that is completely unreal, something that I can only conjure through cinema and my dreams. I grew up adoring the Ray Harryhausen films and I still watch those from time to time. Enjoying them for what they are. I was hoping "Seventh Son" could have been some goofy fun, something that embraced today's technology to make an off-the-rails monster movie. I didn't know that this movie was based on as series of novels, something that is becoming common in the realm of Hollywood these days. But here lies the problems. "Seventh Son" is never very much fun, it is never adventurous, it is never Romanized. It is a movie that never once feels epic, and I have a feeling that "Seventh Son" will join the Golden Compass Club and be the first film in a fantasy series that never sees the rest of the series materialize onscreen. I am not really sure if this movie takes place in a fantasy world or not, since the mythology and background of the movie are so poorly explored or explained. But in this world the characters inhabit, monsters and witches exist. There is apparently a secret of order of knights who protect the world from such evil. After many years of battle, there are only two left, a master and his apprentice. After Master Gregory (Jeff Bridges) watches his apprentice die before his eyes. 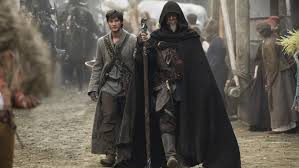 He must seek out Tom (Ben Barnes), who is the seventh son of the seventh son, which is basically code for Tom is "the one" who must spend the rest of the film fulfilling his "destiny." They eventually find out that Mother Malkin (Julianne Moore) an old foe of Master Gregory is back and they must band together to stop her. That is basically the movie. It is decked out with a montage of Tom's training, which leads into a long stretch of film focusing on "Will Tom Become The Hero He Needs To Be Or Not," which will be followed by seemingly several dozen fight sequences which will feel like you are watching someone play a one-player video game. There is no emotional heft to anything anybody is doing onscreen, there is no sense of emergency to the storyline and absolutely nothing feels epic in the movie. It feels like it is over before the movie really begins and because there is nothing grappling with our hearts, minds or empathy. "Seventh Son" looks like a bunch of talented actors, playing dress-up and reenacting "Lord of the Rings." Throw in an uninspiring musical score and terrible special effects and you have stomach-churning mess. I honestly don't remember the last time I have seen Jeff Bridges so bad in a movie before, and I mean that sincerely. You will read this in other reviews of this movie, and each critic seems to hit it just right. Bridges has recently gained an obsession with using this weird, mushy geeky accent in his movies. It is really starting to get annoying and it took me completely out of the movie during several instances. Why he does this, I don't know. It doesn't bring any weight or originality to the character, so why even bother? I also didn't really get if Bridges is suppose to be foreign, since the movie never explains a goddamn thing in this entire movie. Jeff Bridges ends up looking silly for no apparent reason, making it not very funny at all. Julianne Moore on the other hand, is something else entirely. I have a feeling that once this movie hits DVD stands, you will see roughly ten of Moore's scenes from this movie on that "100 Most Unintentionally Funny Scenes in Movies" video on YouTube. She really is that bad. Her and Djimon Hounsou both embarrass themselves as the villains of this movie. Their lines are delivered horribly and the lack of direction shows that they didn't know whether to be campy or serious and the film's tone seems to be all over the place. Ben Barnes is someone that I will never believe ever becomes a movie star and watching him trying to help carry this film is painful. Do you like Kit Harrington from "Game of Thrones?" Well, he's in this and when I saw him, I perked a bit. But he's in so little of the movie that it doesn't matter and its too bad. I didn't know what to think of this movie going in, but I had no idea it was going to be this bad. When you have A-Listers like Bridges, Moore and Housnou in a movie, you expect big things from the acting department, which we didn't get. When Claymation monsters from the 1980's look more fearsome than a bunch of computer-generated monsters, then you know something has gone terribly wrong. It's sad when I find a movie that has no redeeming qualities at all, I hate sounding like a big bully. But I must say what I need to say, and it seems to me that "Seventh Son" is a failure on pretty much every level.